Oddly enough, when we searched for the same keywords on Yahoo, Bing or Duck Duck Go, each search engine brought up exactly what we were seeking. Try this experiment yourself and see what you come up with. It does not just have to be for this story—if you find other stories and search terms that Google appears to be suppressing, let us know. 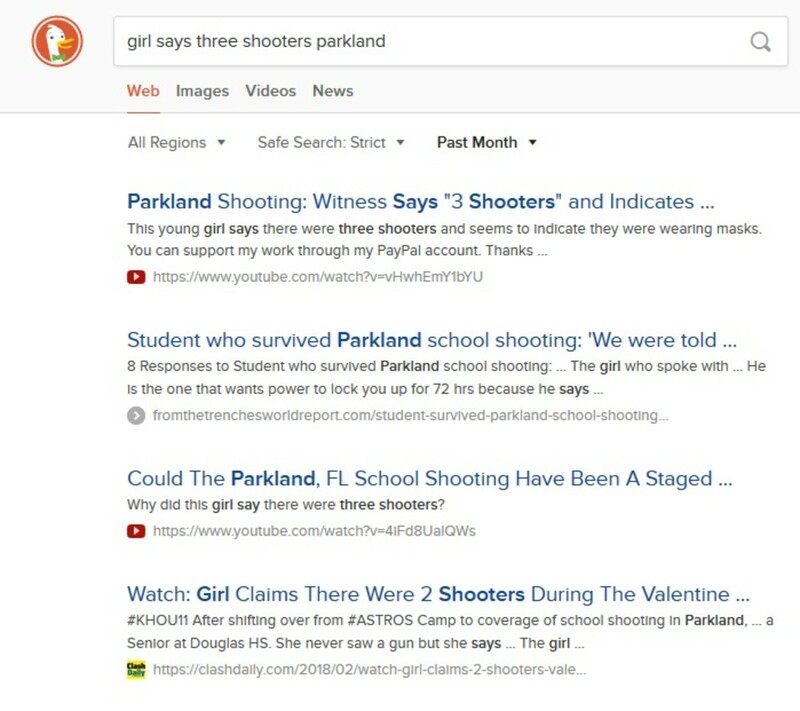 Below are screenshots from Duck Duck Go and Bing. We did not post Yahoo because their results were identical to Bing. Google became the most popular search engine on the web because it connected people with the links that were close to their searches while offering up a wide variety of different sources. But now it is obviously far past time to move onto more trusted platforms. In the early days of the internet, search engines and service providers like YouTube acted as a gateway to the world. But over the years the most powerful of these companies have increasingly begun to act as gatekeepers, caving into pressure from the government. 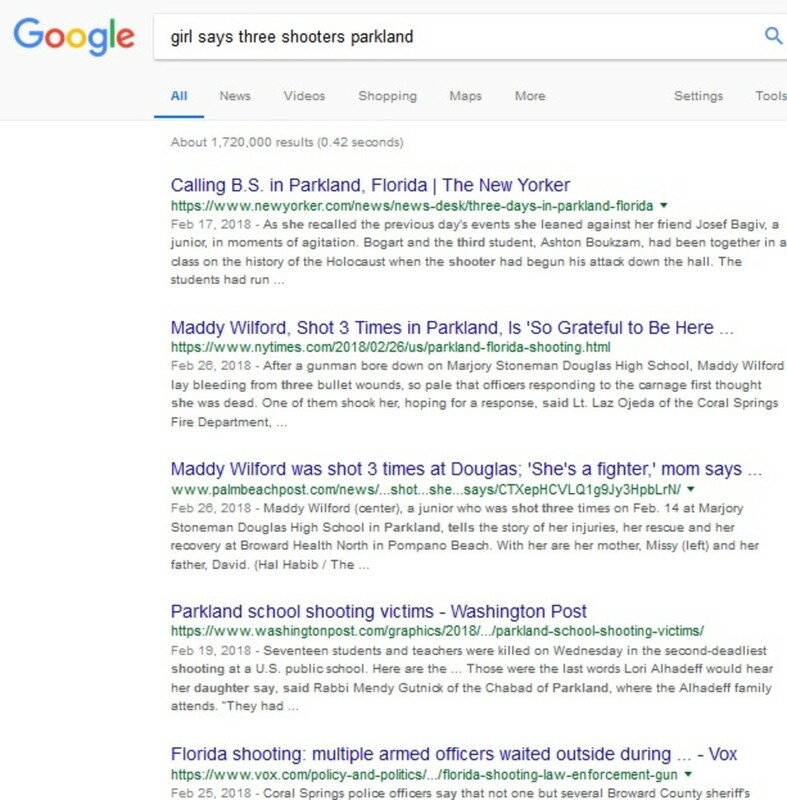 In the last two years, censorship on the internet has been brought to an all-time high, thanks to “fake news” hysteria and a consistent campaign from the mainstream media to silence dissenting voices during times of tragedy when the official story has come into question—like the recent shootings in Las Vegas or Parkland. Instead of investigating stories and asking tough questions, the mainstream media simply regurgitate press releases from police and government agencies. Before the internet gave birth to the alternative media there was only one side to every news story, the official narrative, and for the most part, everyone believed it. Even if news outlets have partisan disagreements about politics, they always sell the basic version of reality, especially when it comes to questioning information handed down from those in authority. As the alternative media has grown in size and relevance in recent years, there has become a wide range of perspectives for people to choose from, and there is no longer just one side to the story when large news events happen. Now there are many different investigations and theories behind every event—from the brilliant to the insane—leaving it up to the reader to use their own critical thinking when reading this news. Critics see this as some type of breakdown of reality, where everyone just adopts whatever version of the world that suits their needs. While this is a legitimate problem that does happen to some extent—in the case of online echo chambers and actual fake news—these things are far less dangerous than allowing an all-powerful media cartel to think for us.